This is my final progress post for the Mount TBR Reading Challenge. I aimed for the Mount Blanc level: reading 24 of my owned TBR books during 2017. That meant reading two books every month, preferably at least one of those from my physical TBR shelf. All of them had to have been bought before 2017. In December I completed the Mount Blanc challenge by reading 1 final owned TBR book! When a party of goblin warriors find themselves trapped behind enemy lines, it’ll take more than whining (and a bemused Elven veterinarian) to get them home again. This was a fun fantasy novella. It took me a while to get used to the goblins and remember who was who, but in the end I was on board their adventures. There was almost a Discworld-esque City Watch vibe with them in places. The elf was also a refreshingly different elf character, and a very Kingfisher-style character at that, what with his gardening and animal caretaking. The main plot was surprisingly dark and poignant. All in all, a nice romp. I did it! I reached Mount Blanc by reading 24 TBR books that I had already owned before the year 2017! I didn’t quite reach my ratio of half physical and half ebooks: I read 9 physical and 15 ebooks. So while I didn’t make a lot more room on my physical TBR shelf, nine is better than nothing. I hope all your 2017 reading challenges were successful, too! I’m not quite sure what challenges I plan to tackle in 2018, but I’m sure I’ll come up with something. Meanwhile, happy New Year! This is my sixth progress post for the Mount TBR Reading Challenge. I’m aiming for the Mount Blanc level: reading 24 of my owned TBR books during 2017. That means reading two books every month, and I would prefer at least one of them to be from my physical TBR shelf. All of them have to be bought before 2017. In October I read a lot of my owned comics and books, but none that I had bought before 2017. In November I managed to read 4 owned TBR books, out of which 2 were physical books, so that made up for October. This is a high fantasy book from 1990. The plot seems very basic: a trio consisting of a prince, a thief, and a wizard are sent to get back the precious Fire’s Stone that keeps the kingdom from being buried by a volcanic eruption. But the focus on characters made it feel a lot more unique. We delve into the main characters and their weaknesses and especially their relationships with their ruler fathers. The prince wants his judging father’s acceptance, but drowns himself in parties, alcohol, and affairs because he has nothing to do – people don’t want the younger son mixing in politics. The thief is haunted by the memory of his cold, abusive father and the early love of his that the father killed, as well as the homophobia of his birth country. The wizard doesn’t recognize the father that has distanced himself after her mother’s death. She is also being pressured into getting married, because otherwise she can’t inherit the throne, while she would just want to focus on her magic studies and her kingdom. I loved the great bond between the three main characters in the book, and the fact that there’s a country where bisexuality is the norm. The attitudes toward fat people are bad, though, so a content warning for that. Finnish edition. This was a non-fiction book that I picked up from my library’s book swap shelf. The subject matter was interesting, but the focus turned out to be a bit different than I’d expected. I thought the focus would be more on the King and especially on Versailles, but it was more on the King’s mistresses and assorted political events. It was also clear which people the author especially liked. I wanted things to be followed through chronologically, but e.g. the effect of someone’s death might be stated in one chapter, and in the next one the person would still be alive, because of the focus of that chapter. I did learn some things, but not enough about Versailles. The spinster governess Miss Pettigrew is accidentally hired by a young actress, Delysia LaFosse, who is looking for a maid. An unforgettable day ensues. I had seen the movie adaptation a few years ago, but didn’t remember a lot of the twists and turns. Miss Pettigrew is a delight to follow, she’s a great character who decides, for just one day, to just go for it! She is thrown from one tricky situation and wild party to the next, and manages to be an absolute boss. The attitudes in the book are outdated (sexism and racism), and I hated the Mr. Right, the supposedly “good” love interest of Delysia’s, mostly because of this. The final book in the Patternmaster or Seed to Harvest series in inner chronological order. I’ve been slowly reading these books from a digital omnibus edition. This one is set far in the future where telepathic Patternists and alien-mutated Clayarks fight over Earth, while regular humans are a minority who serve the Patternists. We follow Teray, a young Patternist who leaves school to become an apprentice before starting his own House, but instead finds himself being forced into the House and under the power of a strong Patternist. Patternmaster and Mind of My Mind, the fourth and second books in the series, are among my favourites. They are also the ones that Butler wrote the earliest in publication order. I think I prefer her earlier works because they are “easier-flowing” and more character-based – all of the series focuses on power structures, the abuse of power, and a bunch of other, hard topics, but the ones that were written later were much grimmer. Wild Seed, the first one in inner chronological order, but a later book in her career, is clearly better written, but my reading experience was so much harder and more uncomfortable because one of the main characters was so unpleasant. Which he was meant to be, but still. Those were all the books from October and November that qualified for the challenge. I also read 9 owned books & comics that I bought this year, so they didn’t qualify. Onwards to the last month of the challenge! I am only one book away from finishing the Mount Blanc! This is my fifth progress post for the Mount TBR Reading Challenge. I’m aiming for the Mount Blanc level: reading 24 of my owned TBR books during 2017. That means reading two books every month, and I would prefer at least one of them to be from my physical TBR shelf. All of them have to be bought before 2017. In August and September I managed to read 3 owned TBR books, out of which 1 was a physical book. So I would’ve preferred one more physical book, but I’m still on track. Here is what I thought of the books I read. A collection of four short stories set in the Chrestomanci universe: Warlock at the Wheel, Stealer of Souls, Carol Oneir’s Hundredth Dream, and The Sage of Theare. The short stories were weaker than the Chrestomanci novels, but hey, it’s still Diana Wynne Jones! The Sage of Theare was probably my favourite, and I would give that one about 3 stars. I loved how the Chrestomanci turned up with the flu! My least favourite story was Warlock at the Wheel. I found it quite uninteresting, and btw, shouldn’t that dog have been poisoned by that chocolate cake it ate? A lovely surprise! I got this indie YA fantasy book when it was available for free on Amazon. I was hesitant when reading the first two chapters, because I felt that some elements were introduced a bit clunkily. But the more I read, the more I found myself enjoying the story. The main character, Hitomi, has a great moral compass. I enjoyed her strong sense of justice and doing what’s right at the expense of herself. Also, the book has both mages and vampires, two things that I love reading about! I want to know what is going to happen to Hitomi next, so I will continue on with this series. A collection of short stories written by Saladin Ahmed, the author of Throne of the Crescent Moon. The ebook is available for free. Unfortunately no story in the collection was a huge hit with me, and I have forgotten most of them already. All of the stories were OK: interesting when I was reading them, but nothing spectacular. My favourites were the ones set in the Crescent Moon Kingdoms. Those were all the books from August and September that qualified for the challenge. I also read a couple of my own comics that I bought in 2017 (so they don’t qualify), and those were The Wicked + The Divine Vol. 5 by Kieron Gillen & Jamie McKelvie,Tokyo Tarareba Girls Vol.1 by Akiko Higashimura, and Water Baby by Sophie Campbell. I hope your reading is going well, and I will catch you with my next progress post! 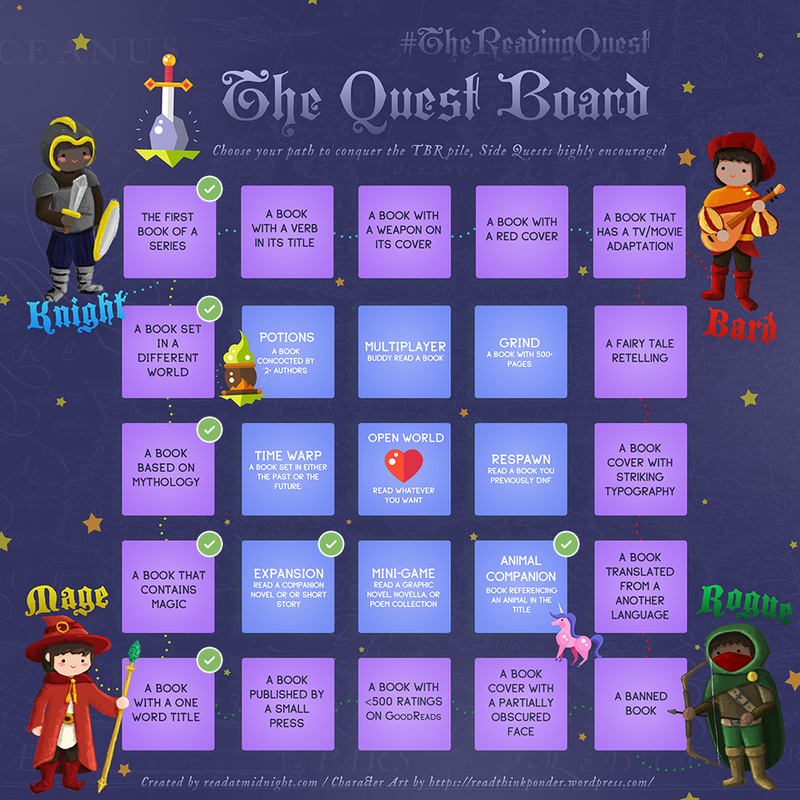 I missed the official sign up for The Reading Quest, which is a video-game/fantasy quest based reading challenge. The Quest started on Sunday the 13th of August, but I was at Worldcon 75 the whole of last week (had two of my Robin Hobb books signed, eek! ), so I didn’t have time to make my TBR post until now. It’s a month-long readathon, though, so I have plenty of time to read despite missing one day. Welcome to #TheReadingQuest! I invite you to join me on a reading adventure based entirely on a video-game quest. In this challenge, you’ll be embarking on a journey to conquer your TBR pile through a series of stages. You’ll read new stories, gain experience, and level up a character of your choosing. The Reading Quest runs from August 13th to September 10th. It is hosted by Read At Midnight and the cute artwork is done by CW of Read, Think, Ponder. The challenge rules about gaining XP and completing quests are here – you can still read along for fun, even though the official sign up for winning prices is closed. MAGE: As wielders of spells and witchcraft, these players will conjure and summon their way through the First Down path on the quest. Their tomes contain magic and whispers of alternate lands. You can have a maximum of +20HP from Social Media interactions (tweets & photos combined). This is my fourth progress post for the Mount TBR Reading Challenge. I’m aiming for the Mount Blanc level: reading 24 of my owned TBR books during 2017. That means reading two books every month, and I would prefer at least one of them to be from my physical TBR shelf. All of them have to be bought before 2017. In June and July I managed to read 2 owned TBR books, and both were physical books! I read so many more owned books, especially in July, but since all of those had been bought in 2017, they sadly did not count for this challenge. It was 3 ebooks and 4 comics. Bummer! But let’s talk about the challenge books. The fourth book in The Dark is Rising series sees Will travel to Wales. I read the Finnish edition from a two book omnibus that contains the fourth and fifth books. I pretty consistently give the books in this series three stars, and this one is no exception. I’ve never been a huge fan of Arthurian legends. I liked the latter half of The Grey King a lot better than the first half, though! It actually gripped me. Now I only have the fifth book left to go in this series. This was an enjoyable, fun romp with a message about respecting your friends, but not a new favourite. Look at that cover, though! Those were all the books from June and July that qualified for the challenge. The bought-in-2017 ebooks that I read were The Dream-Quest of Vellit Boe, Summer in Orcus, and The Book of Phoenix, and the comics were The Girl From the Other Side Vol.1, Giant Days Vol.1, Goldie Vance Vol.1, and Night’s Dominion Vol.1. Check them out if you are interested (the links take you to Goodreads). I especially recommend The Book of Phoenix by Nnedi Okorafor and The Girl from the Other Side Vol.1 by Nagabe. Happy reading! We’re halfway through the year, and it’s time to take a look at how I’m doing with my 2017 Mount TBR Reading Challenge, which is hosted by My Reader’s Block. I chose the Mount Blanc tier, so I’m trying to read 24 of my owned TBR books during 2017. Tell us how many miles you’ve made it up your mountain (# of books read). I’m currently at 15 books, so I am three books ahead of the halfway point! Go me! Choose two titles from the books you’ve read so far that have a common link. The Lost Child of Lychford by Paul Cornell and Of Sorrow and Such by Angela Slatter are both novellas about witches! Although the former takes place in a modern day English village and the latter in a historical-feeling fantasy village. Tell us about a book on the list that was new to you in some way. Borderline by Mishell Baker was by a new-to-me author, and it was a fun, highly addictive, fast-paced urban fantasy book! I’m looking forward to reading the next in the series. Which book (read so far) has been on your TBR mountain the longest? Was it worth the wait? I think The Blue Sword by Robin McKinley had been on my shelf the longest. Sadly, I found it quite slow and very hard to get into. I had wanted to try Robin McKinley for the longest amount of time, but now I really hope I’d started with a fairy tale retelling of hers instead of this old-fashioned fantasy adventure (which sounds good in theory, but didn’t grab me). I’m currently acing the challenge, but wish me luck for the rest of the year! Below are all the books I’ve read for Mount TBR so far. This is my third progress post for the Mount TBR Reading Challenge. I’m aiming for the Mount Blanc level: reading 24 of my owned TBR books during 2017. That means reading two books every month, and I would prefer at least one of them to be from my physical TBR shelf. All of them have to be bought before 2017. In April and May I managed to read 3 owned TBR books, out of which 2 were physical books! So I was one book behind from my goal of two per month. But I’m still ahead in my challenge (thanks to January). I bought a lot of books during this time: five physical books and four ebooks! But here is what I finished. Mark Watney is stuck on Mars. Despite a lot (A LOT) of technobabble and going into details, this managed to be a fun read! I didn’t even mind the technobabble, many times I even (gasp) found it interesting. The book was light in tone, which made it easy to read despite all the science thrown at you. It did take me a month to read this book (I went on vacation in the middle of it), but my slow reading pace and long pauses didn’t seem to take anything away from the experience: the whole structure of it being Mark’s diary helped with that. I later watched the movie, and the book was a lot better. A novella that mixes science fiction with fantasy. The main character, Demane, is a “demigod”, descended from beings from the sky, and is also a doctor who knows a lot about science. The story itself is more of a fantasy journey, a merchant caravan making its way through the Wildeeps. It took me a while to get into the writing style, but when I did, I really enjoyed it. Very interesting world and main character. The final book in the Tawny Man trilogy, for a while Fool’s Fate seemed to be a culmination of the story of Fitz and the Fool – before Robin Hobb went on to continue their story years later.This was a re-read for me, but I’m still counting it for the challenge. It’s been ages since I first read this, and I needed a reread to remind myself of what exactly happened so that I can continue on with the series. I’ve been in love with Robin Hobb’s world for years and years, and The Fool is my favourite character in anything, ever. I loved my reread as much I loved my first read. I laughed, I cried, I felt content at the end. This book definitely needs the background of reading all of Hobb’s previous trilogies first for the reader to get the full story. Love it. Those were all the books from April and May that qualified for the challenge. I also read two other books that I owned but that did not qualify, since I had bought them this year. I really liked them both and would highly recommend them: The Midwich Cuckoos by John Wyndham, a science fiction/horror book from the fifties, and Wylding Hall by Elizabeth Hand, a horror novella that was published in 2015. Check them out if you are interested, and meanwhile, I hope your reading is going well! My name is Maija and I read mostly fantasy - epic and modern, books and graphic novels, adult and ya, anything goes. I'm currently posting mostly my 2017 #MountTBR progress. On other book-related topics I'm more active on my Youtube channel (link below).